The runaway success – and critical acclaim – of Mad Max: Fury Road has confirmed once again that post-apocalypse narratives remain in popular demand. These stories have a long history of reflecting our cultural anxieties. Whether it is nuclear war, plague, meteorite, or climate change, the cause of the catastrophe is simmering in the public consciousness. But why are these stories so appealing? Why do audiences love to dwell on the collapse of civilization and the harrowing years that follow? 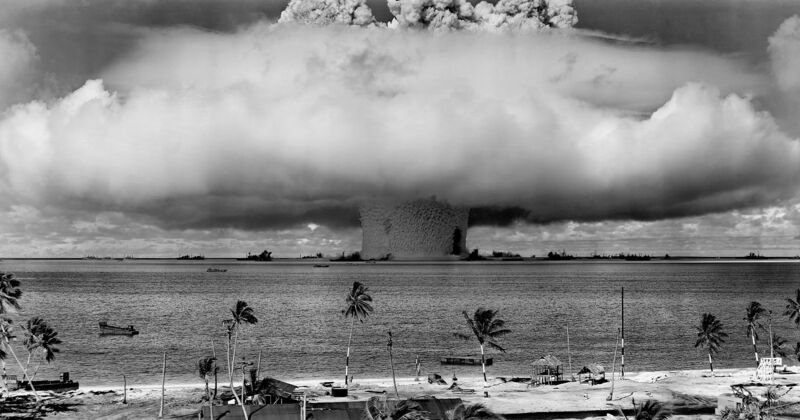 This image of the Baker Test at Bikini Atoll in July 1946 remains one of the most potent images of our potential for self-destruction. It feels appropriate to write this post only a fortnight after writing about Tomorrowland, a film that comes dangerously close to describing our fascination with post-apocalyptic narratives as a pathological obsession. Why do we love stories about the end of the world? It raises an interesting question without giving a satisfying answer. From this angle, exploring the appeal of these narratives feels like a suitable sequel to my post about Tomorrowland. 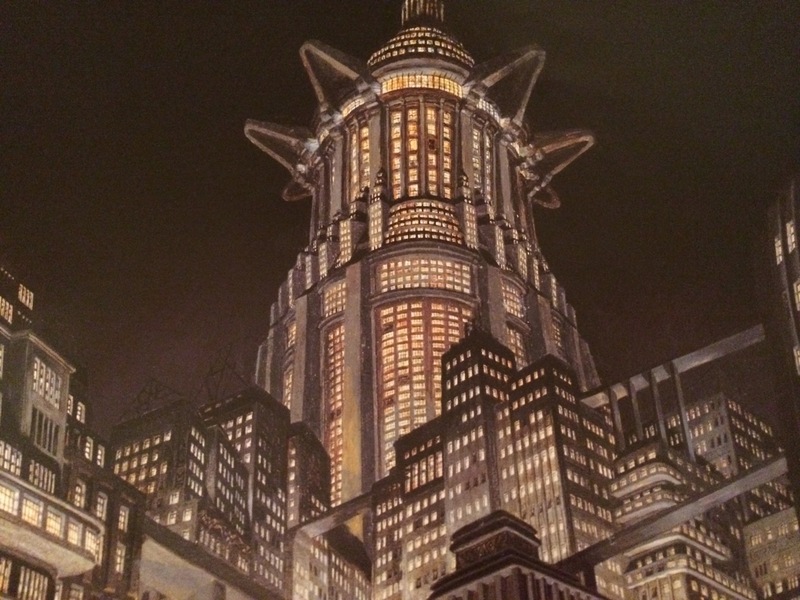 They speak to both sides of the science fiction divide – optimism and pessimism. Yet, despite Tomorrowland‘s implications, I don’t think post-apocalyptic narratives are necessarily pessimistic. Many of them portray the apocalypse as a kind of release, a kind of liberation. The survivors are free from the shackles of society, free from the drudgery of office life, free from social media and mortgage repayments and taxes. They are answerable only to themselves. These stories speak to a society that feels disempowered by an oppressive socio-economic milieu. In a world that is dominated by faceless corporations and governments, where machines are increasingly replacing the workforce, we cling to narratives where the individual emerges on top. And post-apocalyptic narratives are the epitome of this victory. Civilisation itself is stripped away, and the individual is empowered to shape the world around him/her. It is the chance to start things afresh. This celebration of individualism is particularly true of zombie apocalypses. The shambling, groaning hordes represent conformity – mindless masses that have one purpose. The survivors who resist zombies are not fighting for their lives – after all, zombies can adequately sustain themselves on a simple diet of brains – but they are fighting for their individuality. The real threat of zombies is that they assimilate victims into a common horde. One of the hallmarks of modernity is belief in the notion of progress – the idea that civilization is improving and society is advancing through science and technology. By the early nineteenth century, progress was so widely accepted as a “natural” condition of society that it was even being adapted into the leading evolutionary theories of the time. Erasmus Darwin and Lamarck both posited evolutionary schemas that suggested that organisms progressed up a ladder of being. The genre of post-apocalyptic fiction has a long history of critiquing established ideas of progress. One of the first secular narratives on this theme, Mary Shelley’s The Last Man (1826), was written as a reaction against the Romantics, depicting a world that is on the verge of achieving a social utopia before a plague eradicates the population. Shelley understood that civilization was fragile, ephemeral – our progress is ultimately worth nothing. Underlying the genre is the implication that progress leads us to catastrophe. And, as the genre matures, we are increasingly seen as the agents of our own destruction. Whereas early examples generally depicted natural catastrophes (flood, disease, meteorites), the genre evolved in the 1940’s to reflect that we could be responsible for our own fate. The rapid growth of science and technology had given us the atomic bomb and the doctrine of mutually assured destruction. Globalisation had made us more susceptible to the rapid transmission of disease. More recently, we’ve recognized that rampant industrialization has led to climate change. In all these cases, progress leads us inexorably towards our own destruction. J.G. 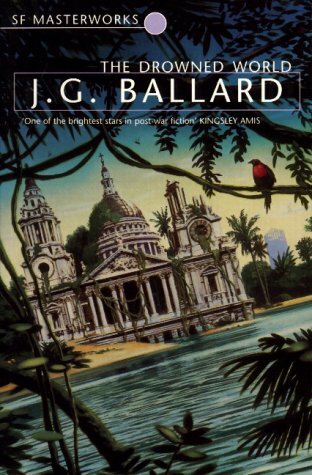 Ballard’s The Drowned World (1962) heralded a shift towards ecological reasons for the apocalypse. The people of the post-apocalyptic worlds often return to a simple agricultural existence. The city – that glowing beacon of technology, progress, modernity – is eschewed for a agrarian lifestyle. It speaks to an inner desire to return to nature, to escape from the bustle and responsibilities that we associated with urban living. On the other end of the spectrum, narratives such as the Mad Max films imagine a future where brute strength is the key to survival. In the water-starved deserts Australia, nowhere is safe from the marauding gangs, and the few oases (such as the Citadel in Fury Road) are ruled by a despotic patriarchy. This represents a fulfillment of purely masculine desires, where social hierarchy is determined by strength. (And it is the subversion of this masculine hierarchy that helped make Fury Road such an engaging film.) It may not be an appealing vision of the future, but it still represents a landscape where individuals are no longer bound by laws. And these individuals – especially Max and Imperator Furiosa – are able to challenge the corrupt patriarchy. The rejection of progress often equates an embrace of traditional beliefs. The role of religion in post-apocalyptic fiction is quite complex, probably deserving its own blog post. (I wrote a lot about this subject in my PhD thesis; it’s one that fascinates me.) Many narratives depict communities that have adopted strong religious values. The best of these, such as John Wyndham’s The Chrysalids (1955) or Leigh Brackett’s The Long Tomorrow (1955), use this to critique the role of religion itself. In stories where the apocalypse was brought about by human technology, these communities often believe that science and technology were responsible for the apocalypse. In stories where it was a “natural” accident, the religious stalwarts say that the disaster was God’s punishment for our diminishing belief. In both cases, religious belief is presented in opposition to scientific progress. The pre-collapse civilisations are often criticized for being morally hedonistic and careless about technological experimentation. But post-apocalypse stories don’t just focus on the survivors or their societies; the landscape also holds appeal. In a world that is largely civilized, we romanticize the idea of the frontier. We long to explore the unknown, to seek out what’s over the horizon. There’s an element of danger out there. Star Trek may have insisted that space was the final frontier, but post-apocalyptic stories bring the frontier firmly back to Earth. These narratives have always had an uneasy relationship with the concept of the frontier. In the aftermath of the catastrophe, the frontier becomes a fluid place, with boundaries that shift back and forth across the formerly civilized landscape. Cities, once the heartland of civilization, are reclaimed by nature, their urban canyons often transformed into threatening locations. This blend of landscapes – artificial and natural – have created some of the most striking imagery in the post-apocalypse library. 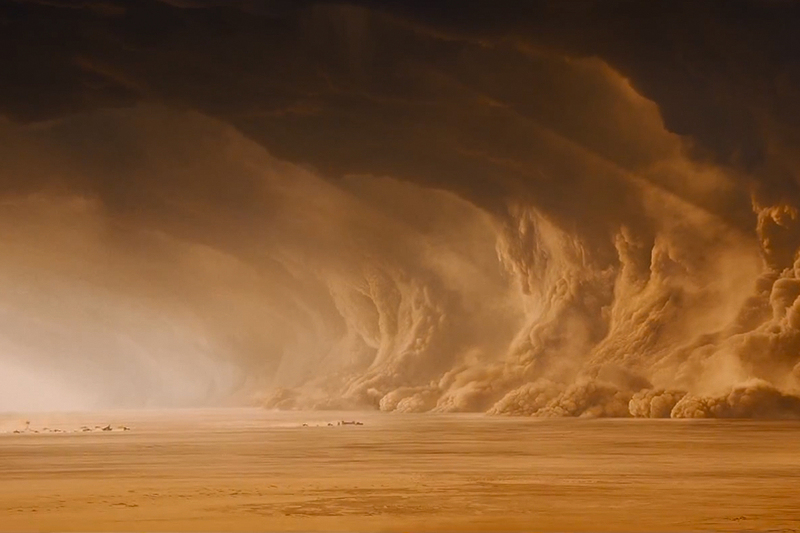 The landscape of post-apocalypse Australia is brilliantly realized in Mad Max: Fury Road. Attempts to conquer the frontier – to restore humankind’s dominion over the Earth – are met with limited success. Novels such as Pat Frank’s Alas, Babylon (1959) have focused on attempts to restore civilization (and the American way of life) in the wake of a nuclear war. In this example, we see a community manage to stay together and preserve their strong American values as the lawlessness of the frontier threatens to overwhelm them. But other stories, such as Leigh Brackett’s The Long Tomorrow, George R. Stewart’s Earth Abides (1949) and – most importantly – Walter M. Miller’s A Canticle for Leibowitz (1959), have recognized the futility of trying to restore order. This new frontier resists colonization. Nature proves to be stronger than civilization. Finally, I think there’s an even simpler reason why these narratives appeal to us – sometimes, we just like to watch the world burn. It is a matter of spectacle – we love to see familiar landmarks buried in the sand, or buildings collapsing into the floodwaters. There is a real sense of romance in these Ozymandian images of decay. I’d love to hear more thoughts and theories about our society’s obsession with the post-apocalypse – feel free to make a comment or recommend a text. I’ve only listed a handful above, but there are hundreds more that make similar points.